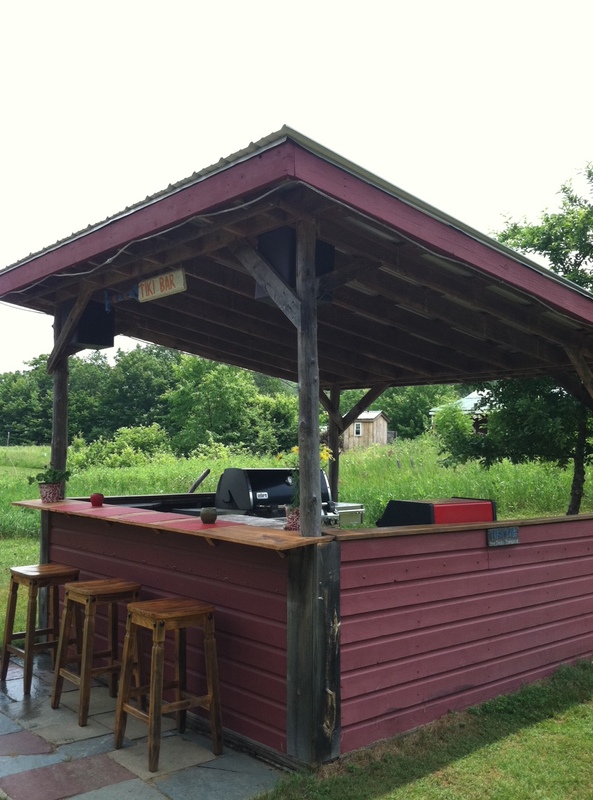 Summer is here and Abbott’s Glen is now offering lunch to guests on Saturday & Sunday at the Tiki Hut Grill.For those of you who have not been to Abbott’s Glen yet, this is officially our summer grilling station. The structure itself looks like something you might see at a local baseball field, a concession stand. It has 3 sides enclosing the structure and a bar top to the widest side with wooden stools for guests to watch their meal prepared. There is a music system & some great bantor while scents of grilled items waft from the hut. We try to vary the menu with 1 hot item & 1 cold. This weekend Sarah, our breakfast chef, made up some yummy turkey sandwiches served on a whole grain bun. 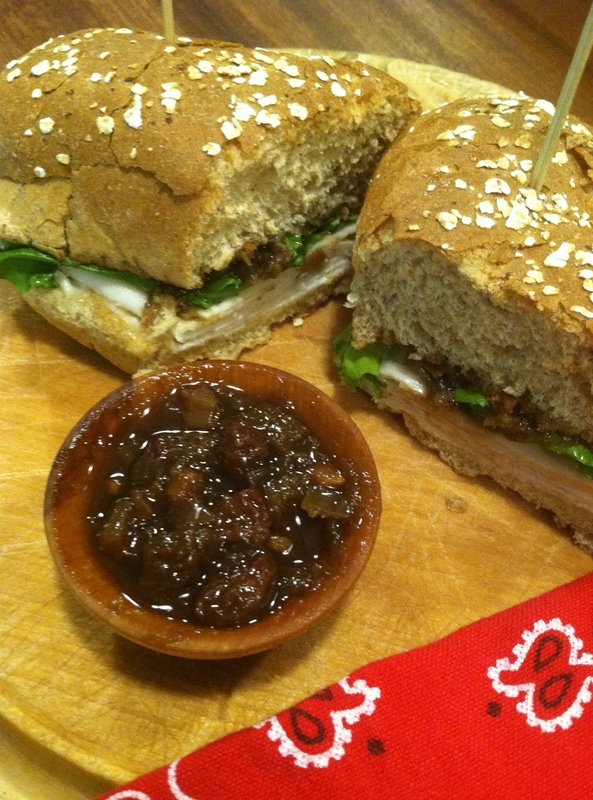 Lettuce, mayo & a dollop of rhubarb chutney was the sauce that made the sandwich special. This would be equally good on cold sliced lamb, or even ham. We have lots of rhubarb as guests & friends are bringing it to the inn in hopes that I will know how to use it. Hmmmmm, how about drinks? 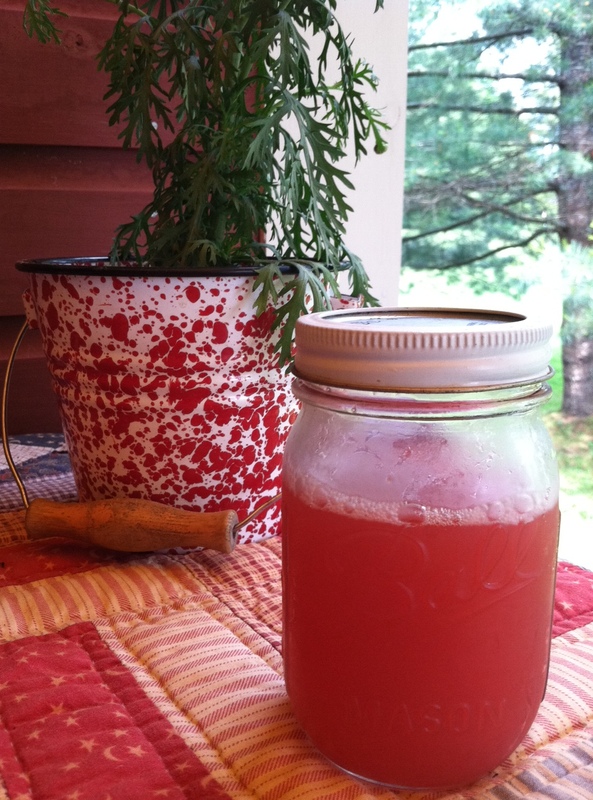 Sarah made up a batch of rhubarb syrup called shrub. It is a mixture of rhubarb, sugar, fresh ginger & vinegar. Boiled up and then strained , the color is a dreamy pink reminding me of memorable sunsets. 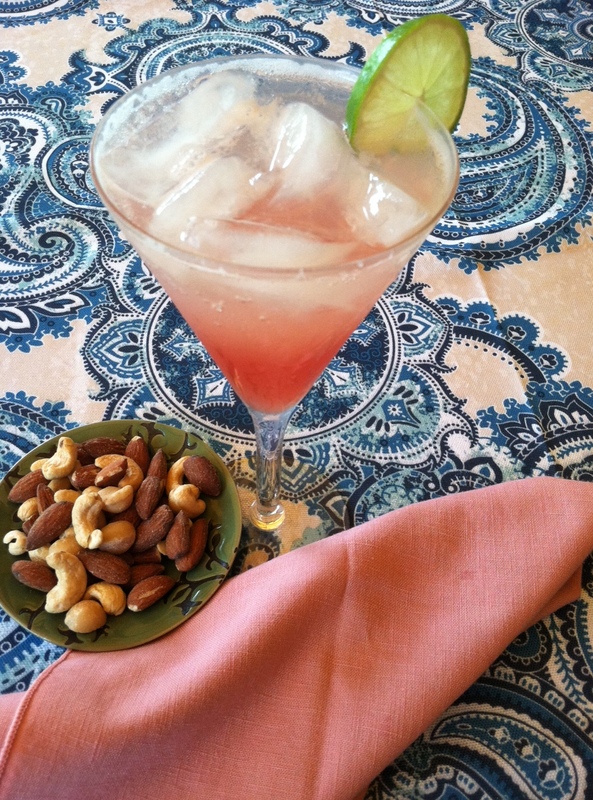 Chilled & then shaken in a matini shaker with gin & lime juice, poured into your favorite glass & topped with bubbly seltzer, and you have an ahhhhhhhhhhh moment. This will definitely become a summer favorite. It is equally delicious without any alcohol. Sorry Abbott’s Glen does not serve alcohol, so this one you will have to enjoy at home. Combine sugar, ginger, vinegar, cinnamon, orange zest & cardamom in a heavy sauce pan over medium heat. Cook, stirring, until sugar dissolves & comes just to a simmer. Trim rhubarb and cut into 1/2 inch slices to equal 4 cups. Add rhubarb, scallions & currants to sauce pan & turn up the heat. Cook for 5 minutes until rhubarb is tender and slightly thickened. Do not overcook or rhubarb will become mushy. Cool to room temperature. Then remove cinnamon stick. Chill until chutney thickens a bit more. Can be stored for 5 ~ 6 days. If serving with a tray of cold cuts, put chutney into a small bowl & let come to room temperature. Garnish with a curl of orange peel. 1 1/4 cups sugar. Being Vermonters I will try maple syrup next time. Boil all the ingredients in a saucepan, about 15 minutes, until rhubarb is completely broken down, stirring occasionally. Strain the mixture into a glass container & chill. Later, Combine 2 oz. of gin, and 1 1/2 oz of rhubarb syrup in a cocktail shaker. Fill with ice & shake 30 seconds. Strain into a glass filling in only 3/4 full. Top with seltzer or club soda. Makes : 12 cocktails. Shrub will hold in the frig for a week.